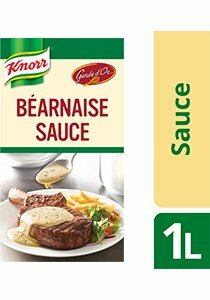 KNORR Garde d'Or Béarnaise Sauce is a ready to use sauce for a variety of dishes. KNORR Garde d'Or Béarnaise Sauce is a delicious and versatile ready to use sauce. This sauce is excellent on its own or enhanced by your own creative touch. KNORR Garde d'Or Sauces complement meat, poultry, fish & vegetable dishes. Suitable for use on the stove, in the micro-wave or bain-marie. Ideal for: Pour Over: Heat in a pan and pour over char grilled or pan fried beef, chicken, veal or fish. Gratinating: Pour over cooked meats or vegetables and grill until golen. Sauce for: steamed vegetables, baked potatoes or as a dip for vegetable crudites, wedges or chips. Volume - 40 ml per portion. Volume - 1 L Per Pack. Baine Marie Stable for up to 4 hours, stirring occasionally. Store in a cool, dry place. Shake well before opening. Refrigerate after opening. Once opened, keep in a refrigerator for up to 3 days.